Each and every day, we are confronted with all kinds of opportunities that vie for our attention and threaten to sap our energy and time. Many of these opportunities are good in and of themselves, such as serving at our kids' school, or helping at our church, or leading a Bible study, or even taking on extra work to help support our families financially. However, if we are not careful with our time, we can soon find ourselves taking on so many obligations that our lives become blur of rushing from one event to another. What our souls really crave is rest-and yet that is one of those treasures we often ignore or fail to prioritize. In this study, readers will examine what the Bible says about the benefits of rest and how it is a gift that God wants them to have. They will also look at how to get through stressful times, apply the brakes and set boundaries, and give their worries to God so they can find true peace and rest in his provision. 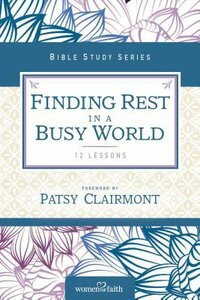 About "Finding Rest in a Busy World (Women Of Faith Study Guide Series)"